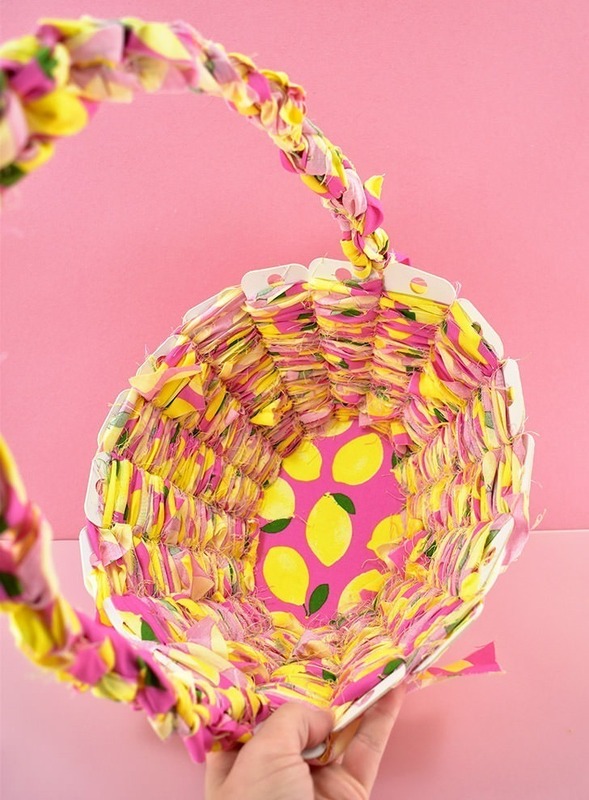 Let’s make a woven fabric Easter Basket using the free SVG file, Cricut Design Space file or the printable PDF! 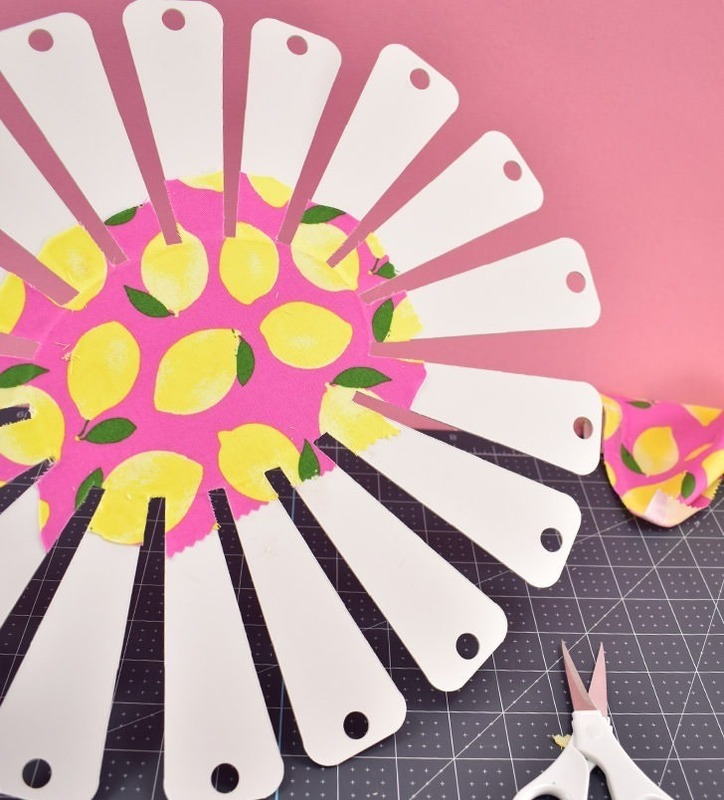 Now you totally don’t have to have a fancy cutting machine for this project BUT a Cricut Maker will make things so much faster. 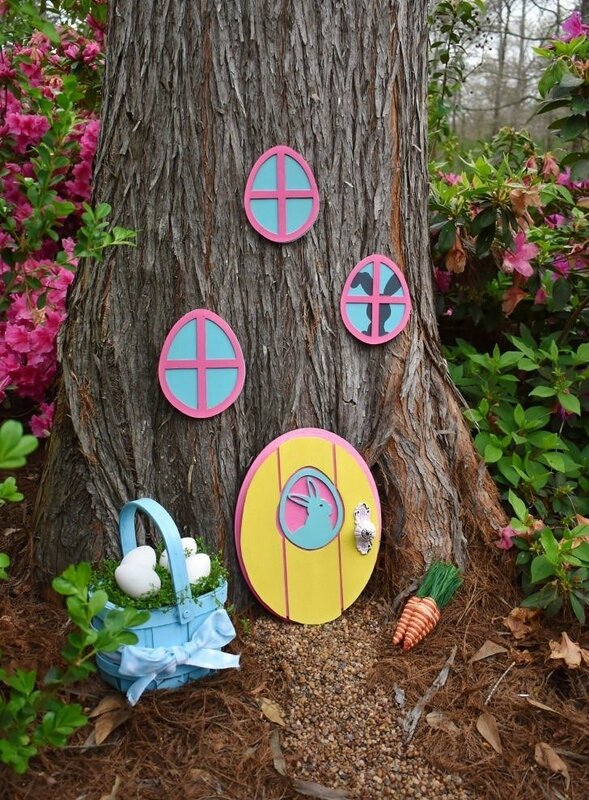 I loved mine until I started playing around with cutting wood for my Easter Bunny Hideaway and now that I have figured out how to cut matboard I am like SUPER DUPER in LOVE. Like it’s my bae. Which is a word I looked up after feeling very old because I didn’t know what it meant and my nephews kept calling weird random things my bae since I’m single and I just kept thinking “what does this have to do with Beyonce?” If you’re an uncool old lady like me, it turns out BAE means “before anyone else” and since my Maker is currently my crafty jam, it’s definitely my crafty BAE! 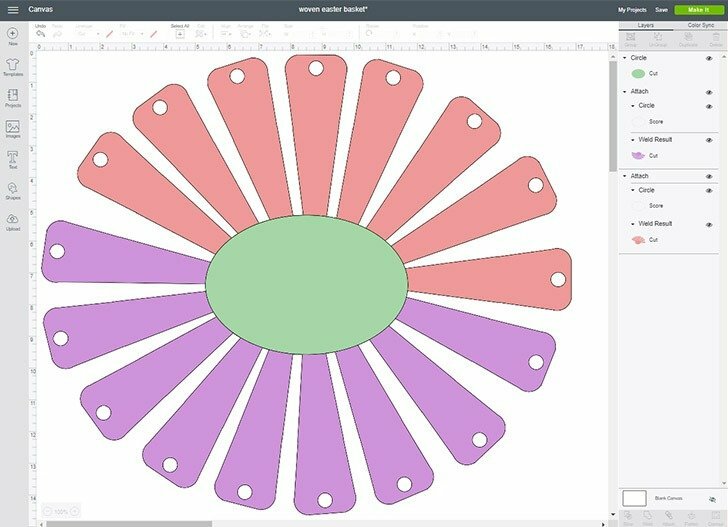 If using a Cricut Maker you can grab the Cricut Design Space file here and get to cutting already. If you would prefer the SVG file, snag that puppy over here. 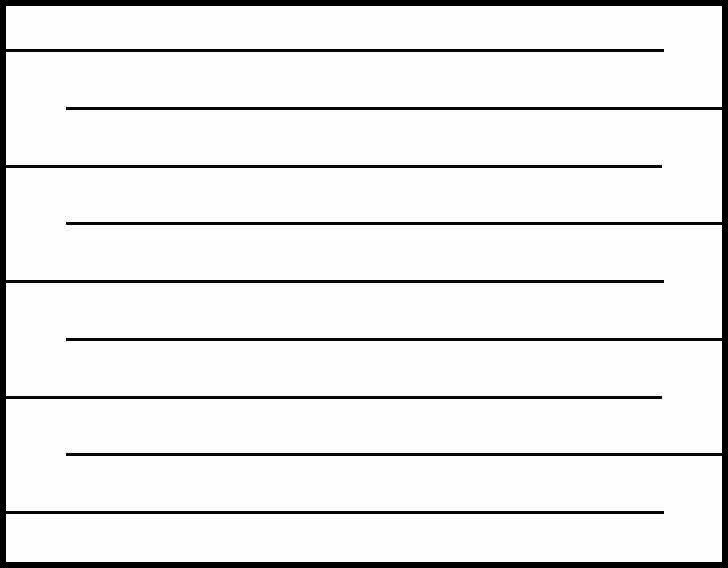 If you’re cutting by hand, bust out this PDF and piece it together to make a big ol’ pattern and cut that business out with a craft knife. Since matboard is thick, it will take several passes with a craft knife, so be patient. I’d also STRONGLY suggest grabbing some cut-resistant gloves to protect your fingers because a craft knife across them like, really, really hurts. And for most of us, the gloves are gonna cost less than our co-pay to get things sewn back on. Trust me guys, get the dang gloves. 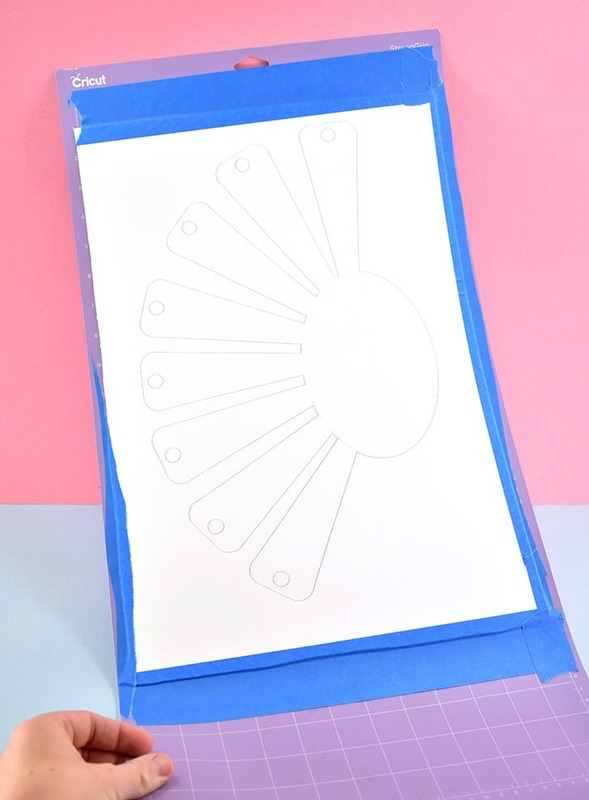 If using your Cricut Maker to cut matboard you will need a 12″ x 24″ StrongGrip Machine Mat and whatever masking tape you already have on hand. 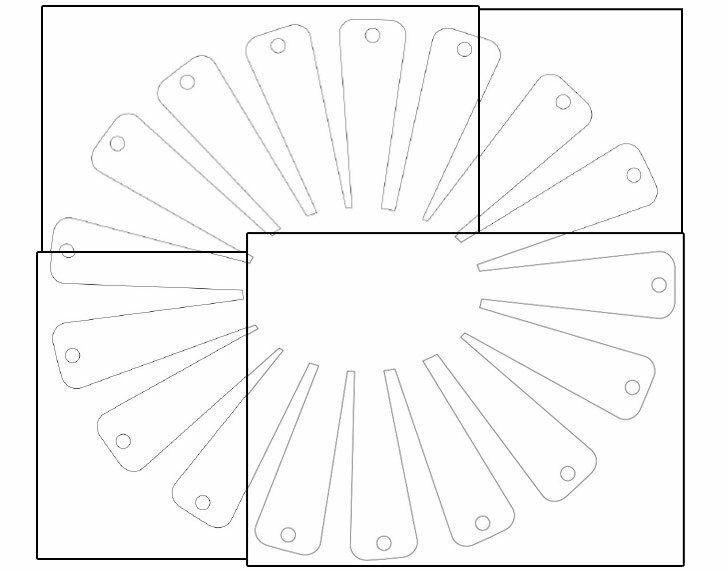 The cut file uses the Cricut Scoring Wheel that makes the flaps bend up much more easily. If you have it, great, if not, you can always score this by hand where the flaps meet the oval shape. 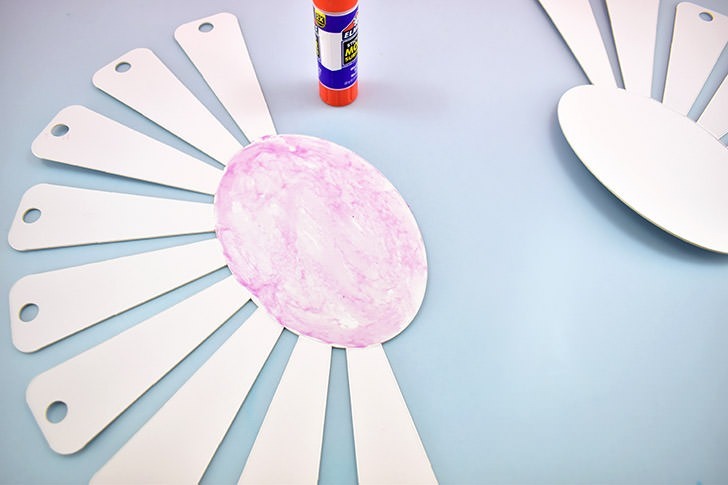 If you used the cut file or SVG you’ll have 2 pieces of your basket frame to glue together. I got some super strong Elmer’s Glue Sticks and, guys, this stuff is pretty epic, but use what you’ve got available to you. If using something wet, like traditional Elmer’s School Glue, be sure to apply weight on top to ensure that the moisture doesn’t warp the matboard as it dries. Be sure when piecing the 2 together, that you don’t have any of the flaps overlapping. 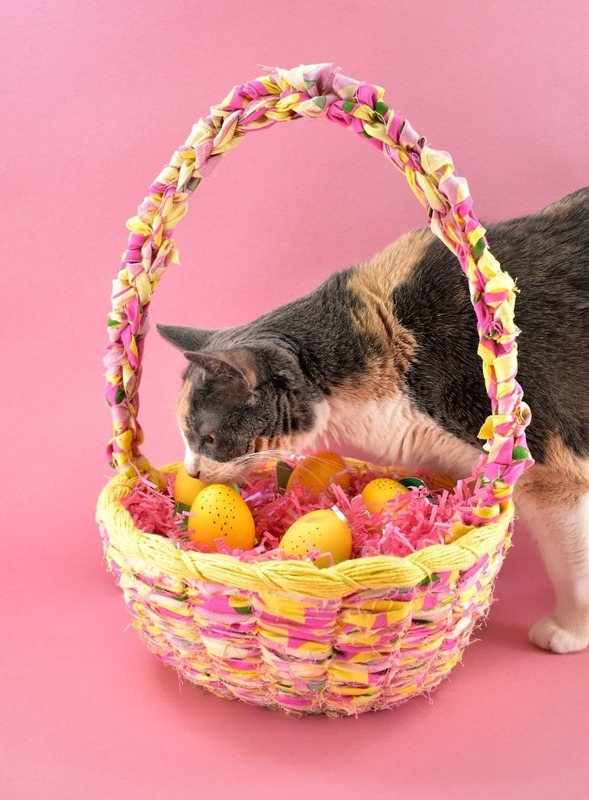 Now that you’ve got your Easter basket frame made, let’s get it ready to weave onto. 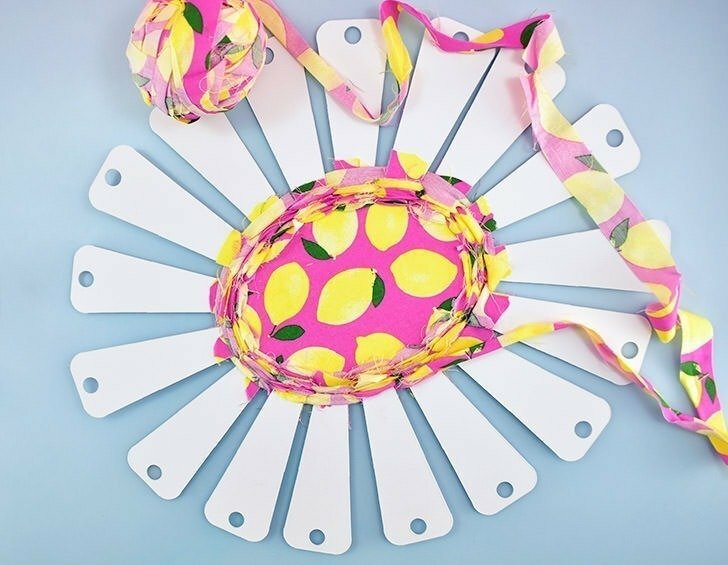 Take a piece of fabric just larger than the oval shape and glue it onto the oval AND onto the flaps that surround the oval. I used that awesome strong glue stick with fab results… Allow the glue to dry. 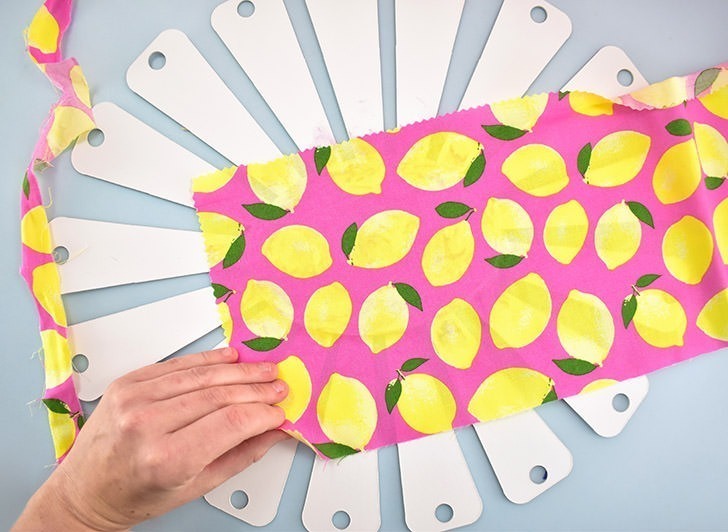 Once dry, flip over and trim away the excess fabric. 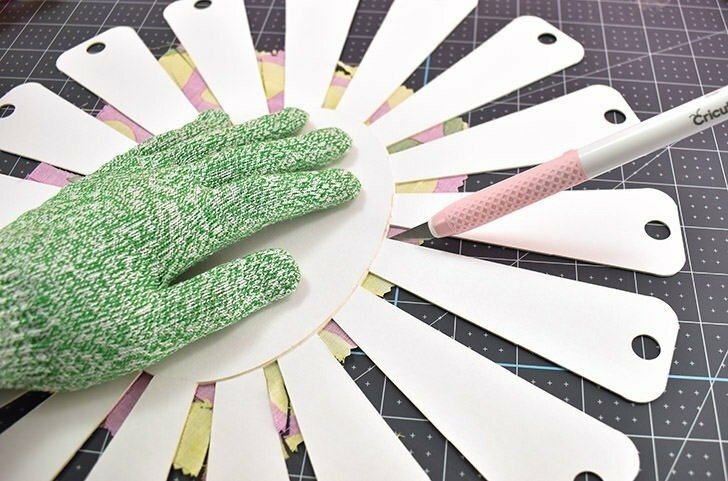 You can use scissors, or for crazy precision, you can use your craft knife and a cut-resistant protective glove. Repeat and cover the other side with fabric, too. 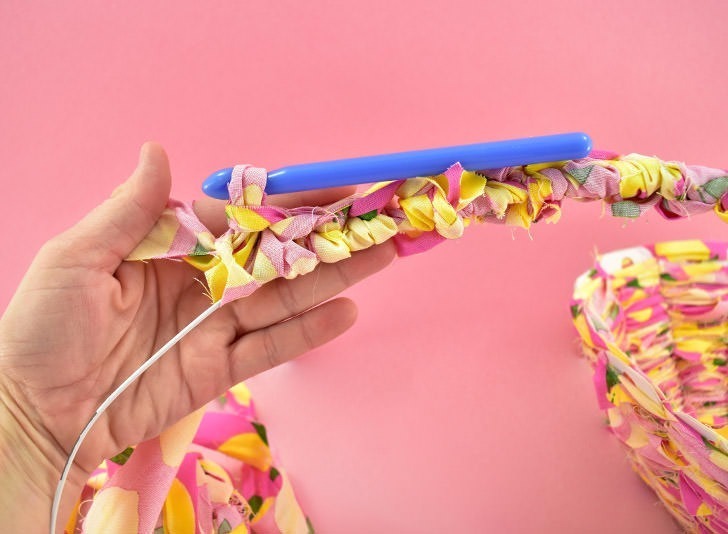 Now you’ll need to cut some fabric yarn and, no worries, it’s super easy to make. 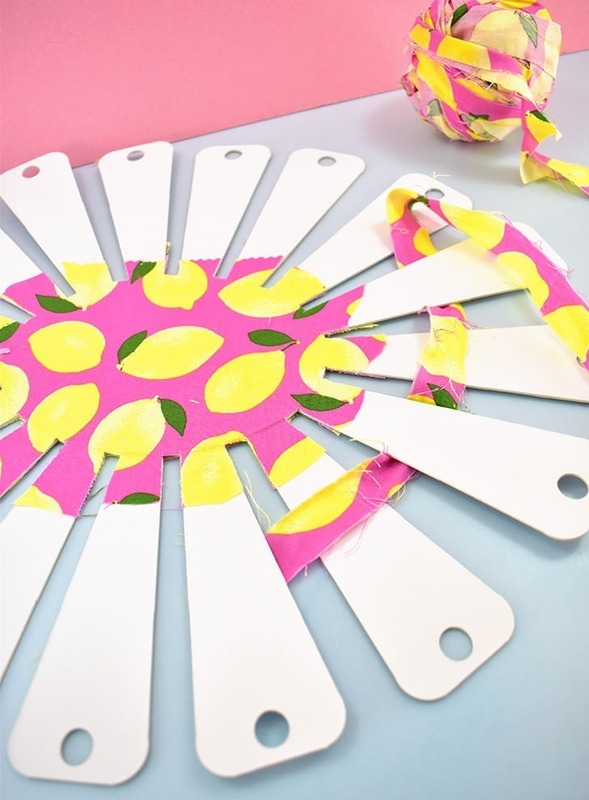 Using a rotary cutter and mat or scissors, slice your fabric into one, long continuous strip about 1″ wide. See that rudimentary graphic above? That’s how you cut a rectangular shape of fabric to make one long piece. 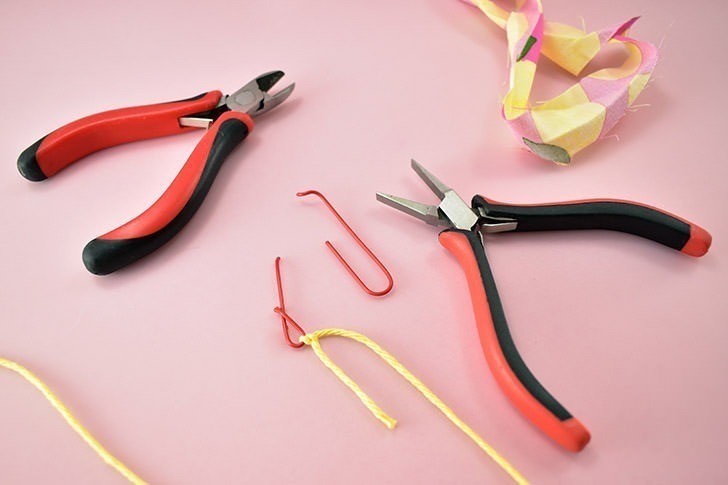 Just make sure that you leave a decent amount of space between the end of your cut and the fabric, so that it doesn’t tear apart easily as you work with it. Also, as you cut you’ll notice that you have sort of blocky edges where the fabric turns after the cut. 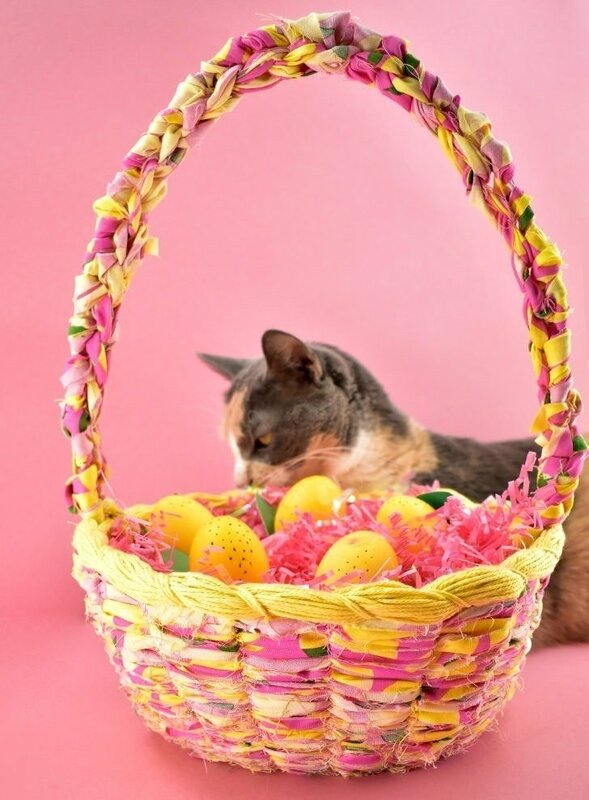 Don’t worry about this, we’ll clean those up once our basket is complete. 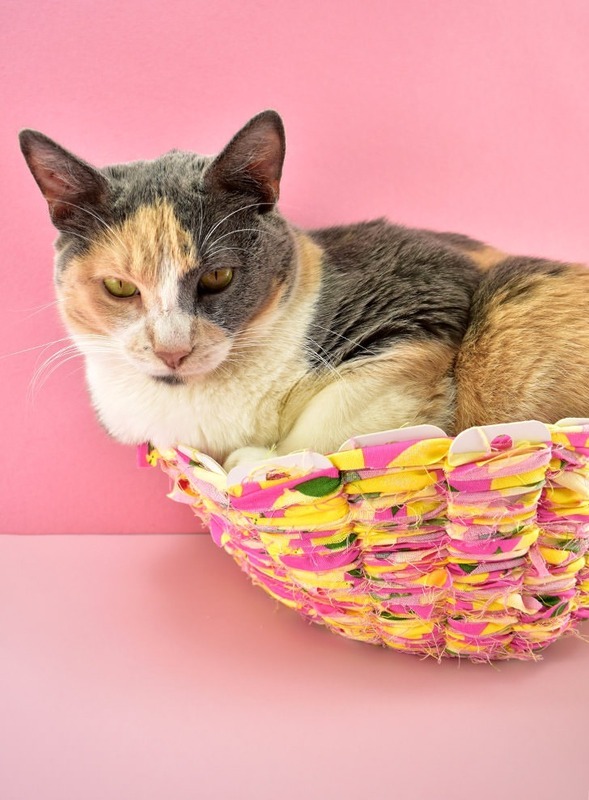 Need some help keeping all of that fabric yarn contained? 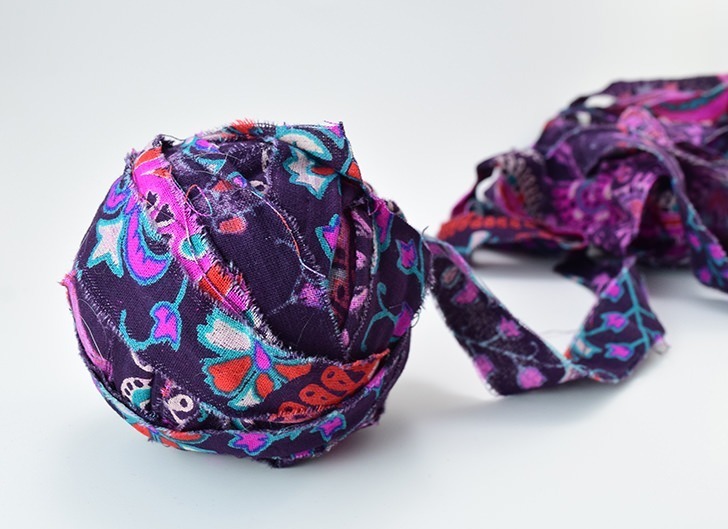 Learn how to make a yarn ball here to keep it easy to work with. Now it’s time to get to weaving! Weave your fabric in front of one flap and behind the next like above. 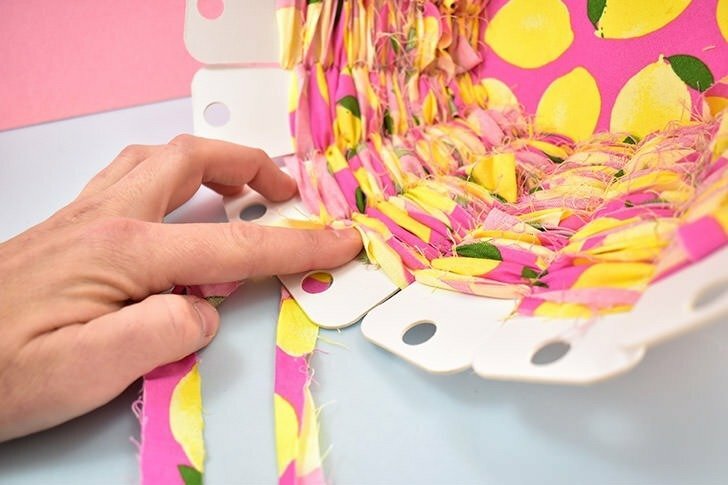 You can use glue on the first flap and allow it to dry so that you don’t have to worry about holding your fabric perfectly in place your first few rows, but this is optional. Continue around and ’round, pushing the fabric toward the center oval piece as you work. You’ll want to push down pretty well, packing the fabric together for a nice, tight weave. 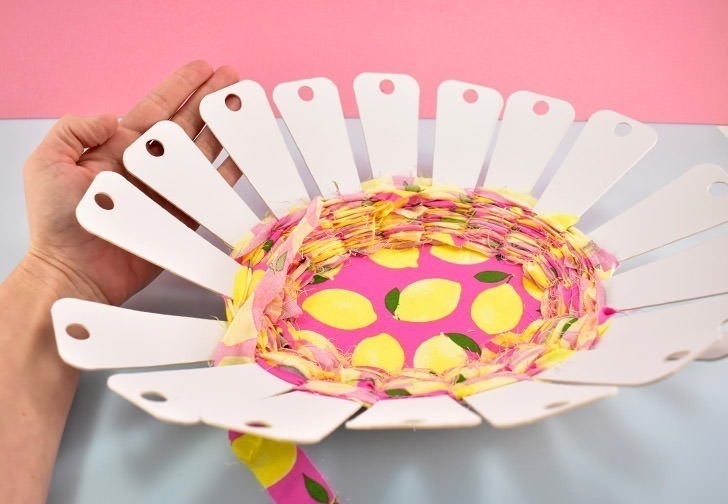 Once you start to get toward the middle, begin pushing the flaps upward to start weaving the basket shape. As you work higher and higher, your flaps will start to touch one another, which is great, but be sure you don’t have tons of overlap. If at this point your flaps are really, really overlapping, undo a few rows of weaving and make it a bit looser. 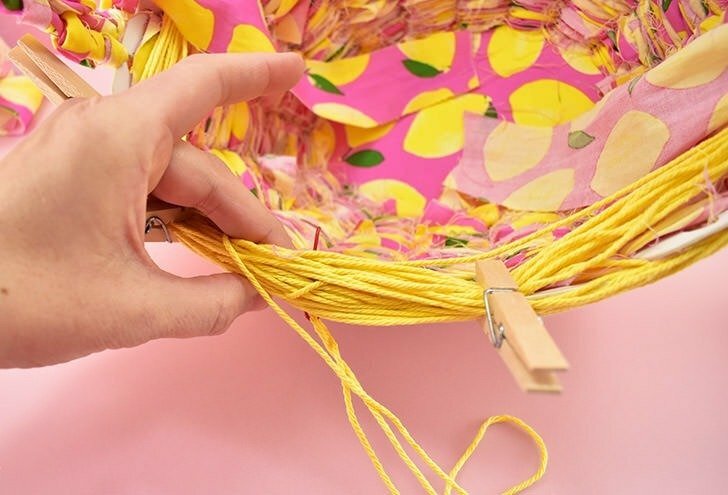 If you run out of fabric yarn and need to add more, or if your yarn breaks at a weak point, tuck the end of the woven yarn into the inside of the closest flap that wraps inside of the bowl. Something flat, like the handle of a metal teaspoon, works out super well. Now tuck in your new piece of yarn into that same spot and keep on keepin’ on. Once you’ve reached this point your basket should be the basic shape you want it to be. If it’s a little bit off, we can still finagle things a bit, so don’t stress about perfection, but if one side is really off it won’t get too much better at this point. 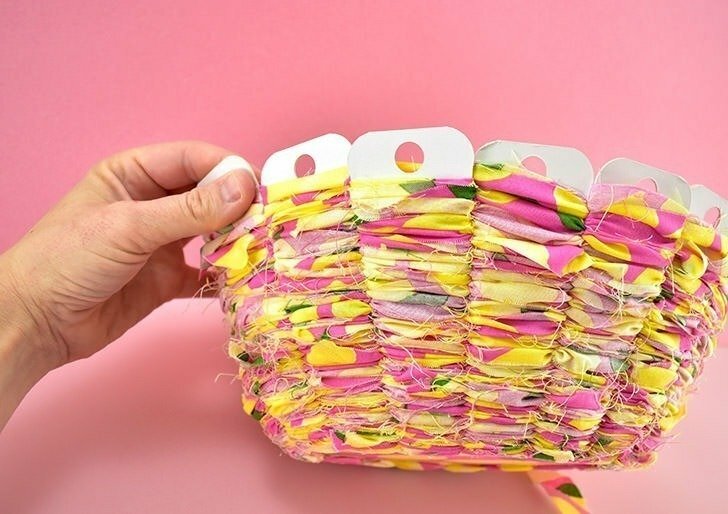 Keep weaving your way up until you’ve covered about half of the holes at the top of each flap. 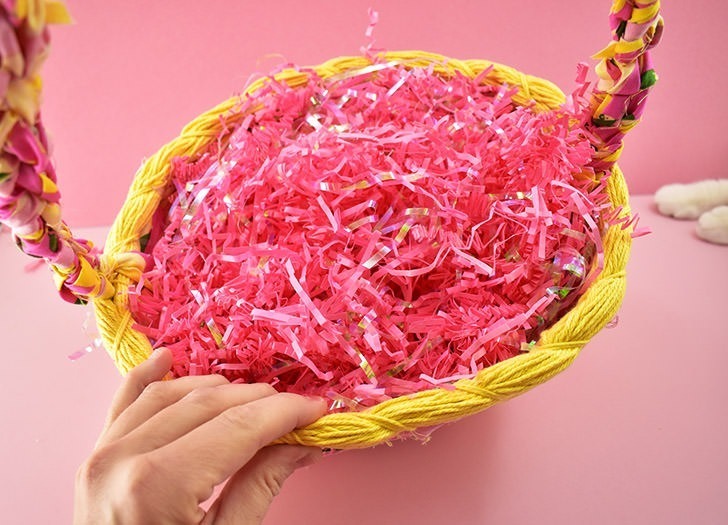 Once you’ve reached this point, set your basket aside and let’s make the handle. 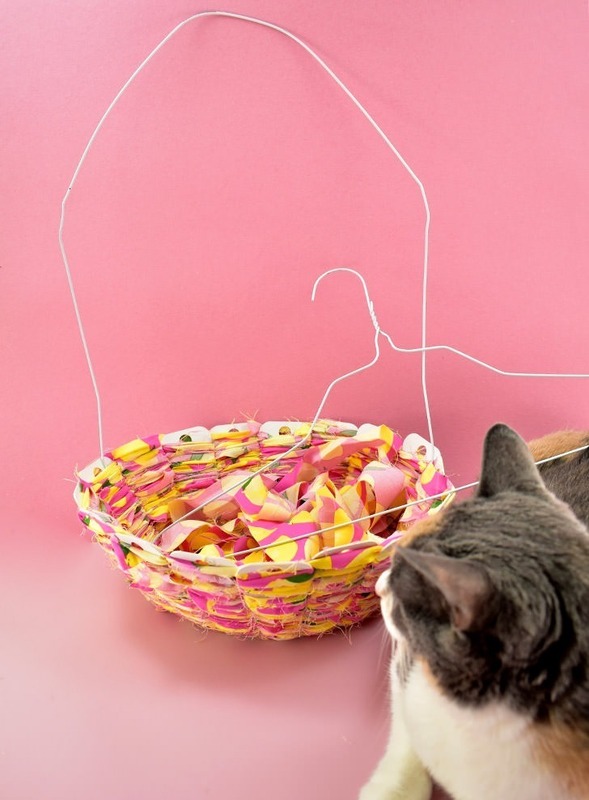 Grab a wire clothes hanger and nip it right near where the metal curves up and starts to form the hook to hang from. Bend and manipulate the shape to look mostly like what you want it to be in the end, a nice, oval shape. 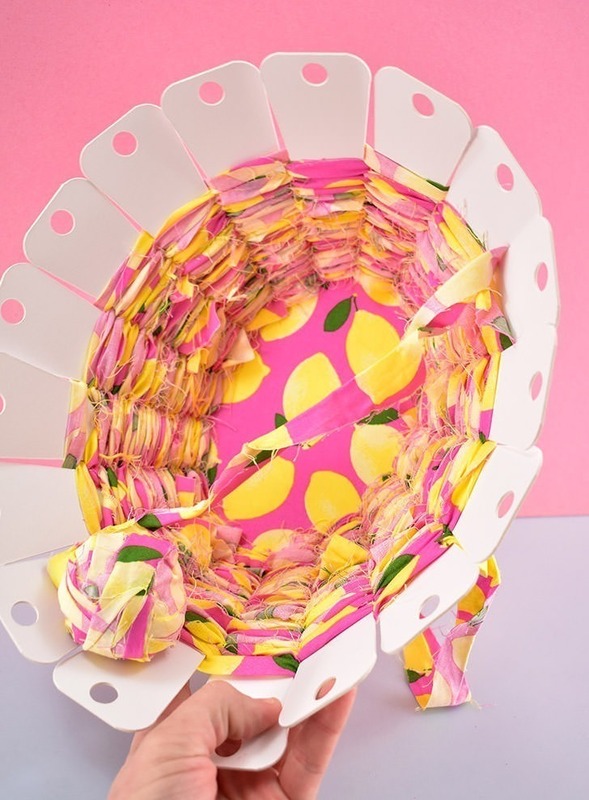 …to save a basket that maybe has gone a bit off kilter, turn it upside down and arrange it to be more symmetrical. 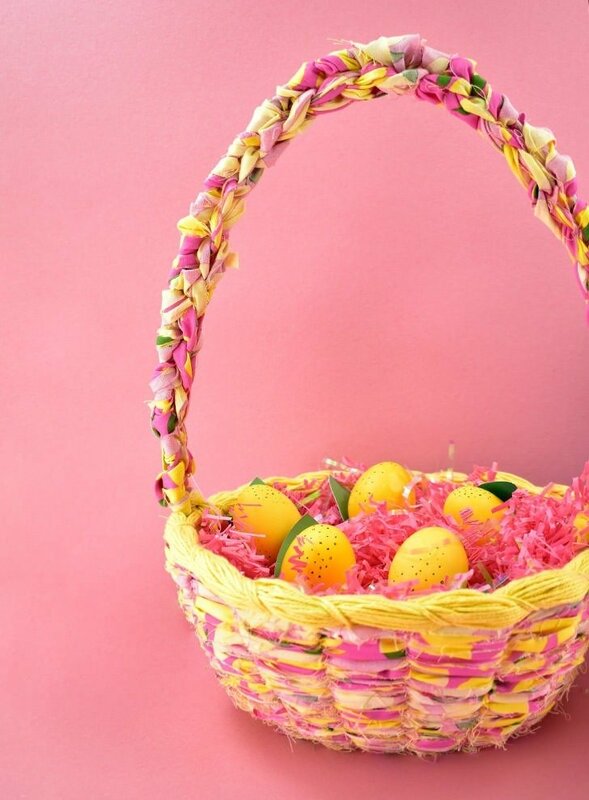 Place some weight on the bottom of the basket, which is pointing upward. Not a lot of weight, just a bit. I used one large-ish hardback book that couldn’t have weighed but a pound or so. When held like this, it will mostly recover its good shape. I know, I know, I could hav just evicted the cat, but look at how happy she is! 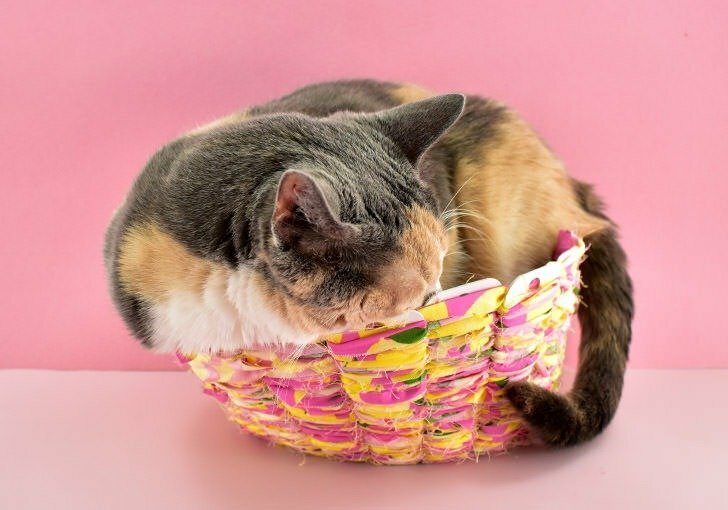 Okay, okay, she’s asleep, but if you’re a cat lover you already get it… Moving on. 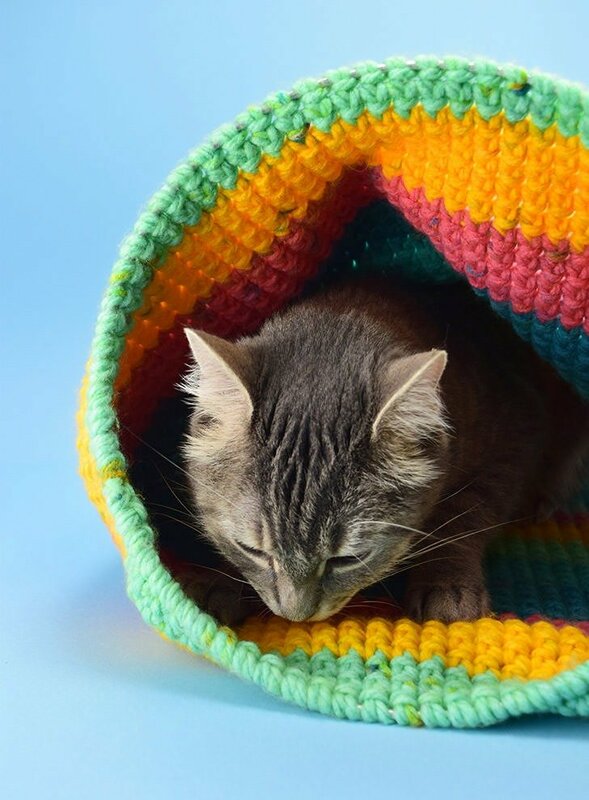 If you need some help crocheting around the round-ish metal, check out this tutorial I made for crocheting around a hoop to make a crochet cat hideaway for the basic idea. If you don’t crochet, don’t sweat it… my initial idea was to do a simple 3-plait braid around the wire but I sometimes have problems with the grip in my dominant hand and I just couldn’t make it work. 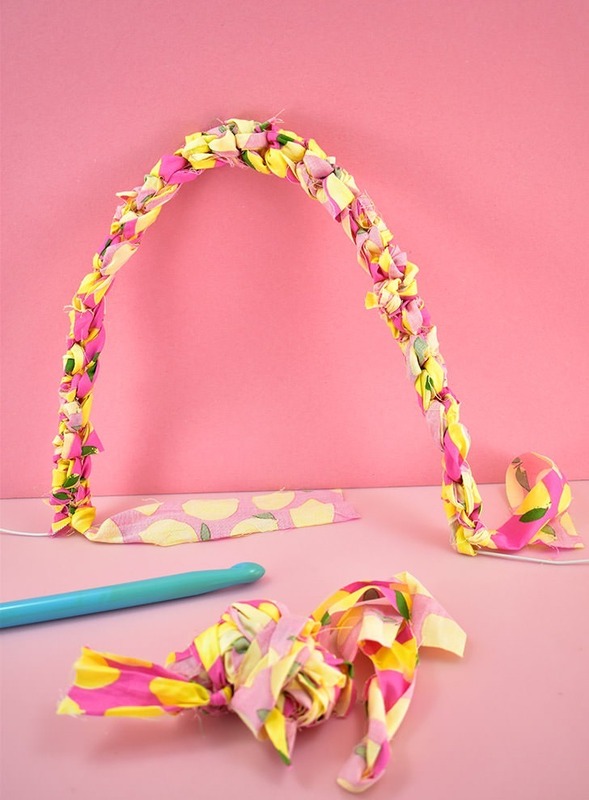 If you can braid hair, you can totally braid a few strips of fabric around the metal hanger. If you don’t braid, either, simply wrap the yarn around and around the handle until you’re happy with the coverage and thickness. If you want it super thick, you can even first wrap the hanger in a bulky weight yarn to bulk up your base! Also because I was having trouble with grip, as I worked down the hanger I’d apply about 8 inches of double-sided tape to the hanger as I worked. This helped to keep my fabric yarn from sliding every which way while I was working, keeping it right where I left it, making it much easier to handle things with a hand that didn’t want to hang on to much of anything :) This is totally optional, but it made things so much easier for me that I figure if you’ve got the tape on hand, anyway, you might as well use it, too! 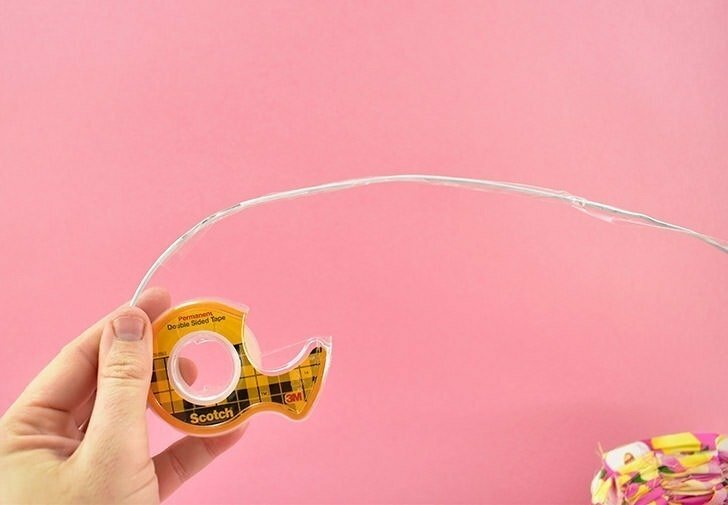 Another way to keep things on track, should you have a difficult time adding the fabric to your handle, you can always bend the wire right at the point you need to start and stop applying fabric like above. You’re going to have to straighten it back out, anyway, so this step is optional and only really helpful to anyone with grip issues. 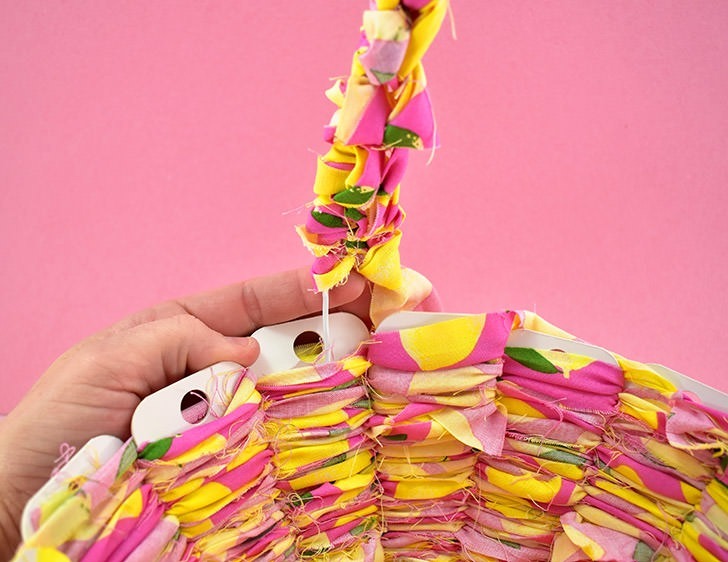 Straighten out the ends of your hanger, if you need to, and eyeballing a good placement on either end of the oval, shove the wire down into the inside of the basket in between the matboard basket frame and the woven fabric. 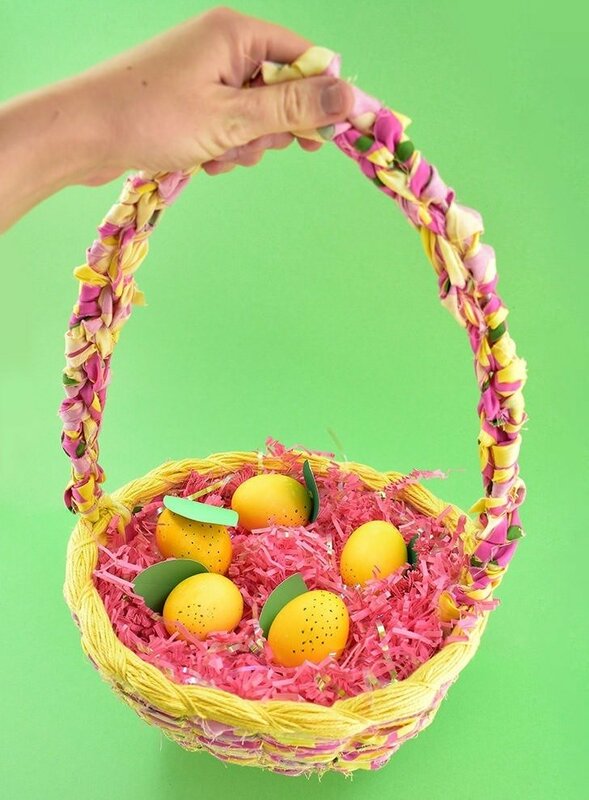 Take a look at your basket and when you’re happy with the placement of the handle, drip some super strong glue like 3600 down in there, moving the wire around to help spread it and push it further down. 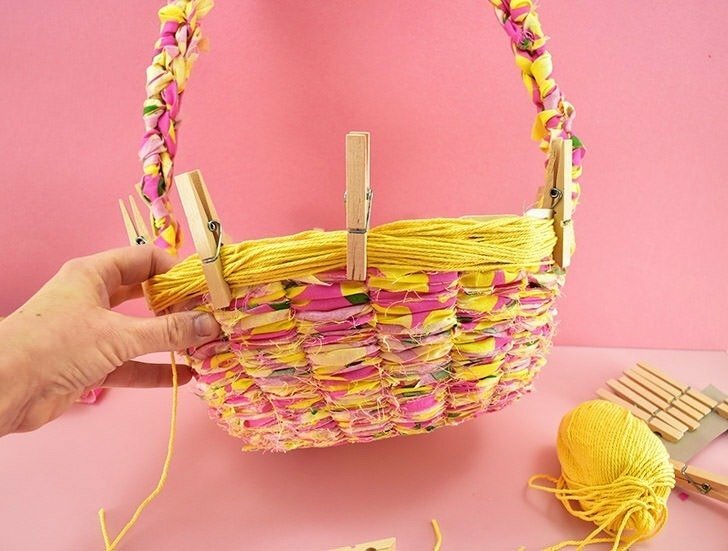 Allow to the glue time to dry completely and give your basket a few tests to make sure the handle will stick. 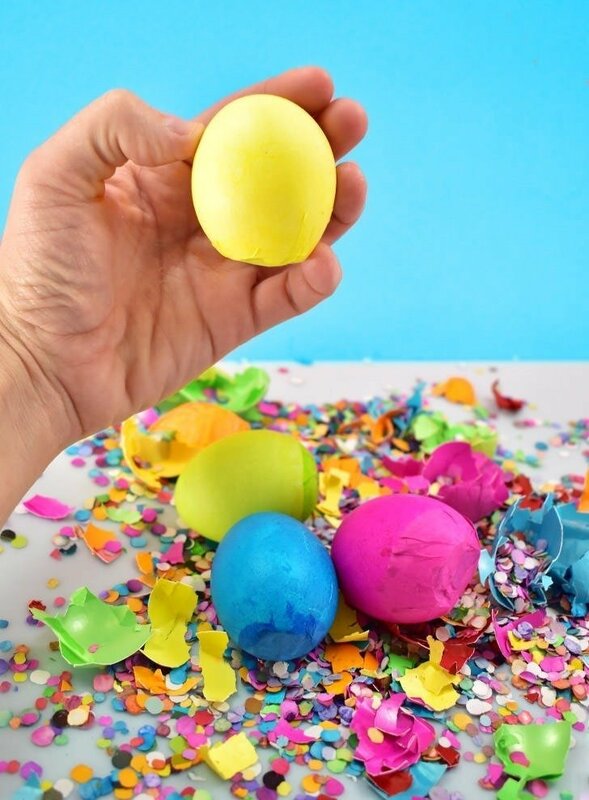 I literally smacked mine against my leg walking around the house for like 3 minutes because that is exactly how I handled my Easter baskets when I was a kid! If the handle stays securely in place after your tests it’s time to move on! If not, glue that baby in better! 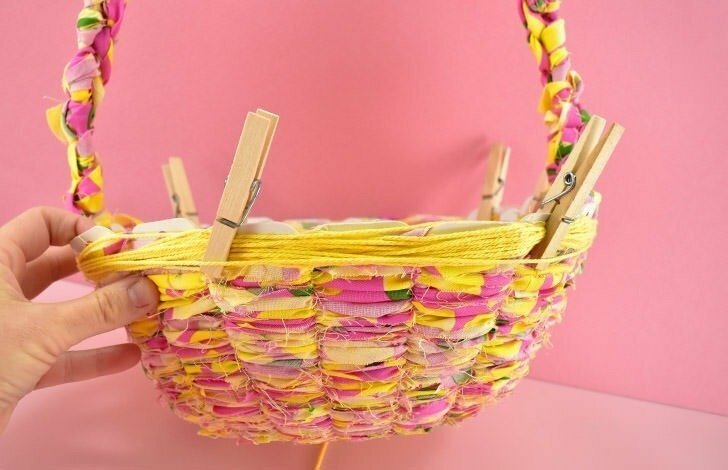 Grab some clothespins and place them a few inches apart around the basket. It’s good to have one on either side of the handle. 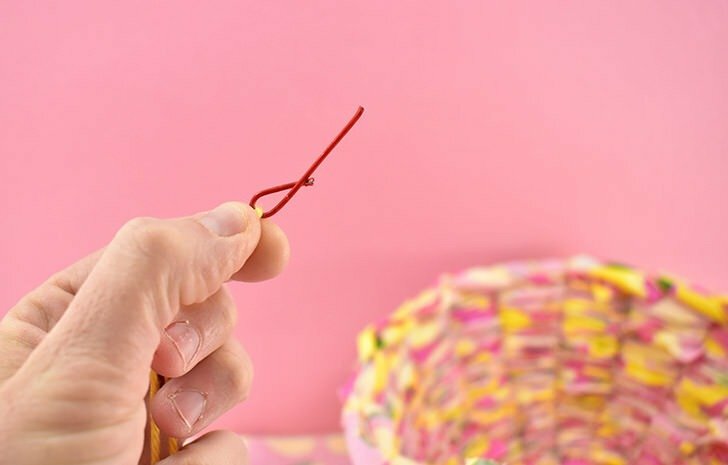 Attach your yarn, with a tail of a few inches underneath one of the clothespins. 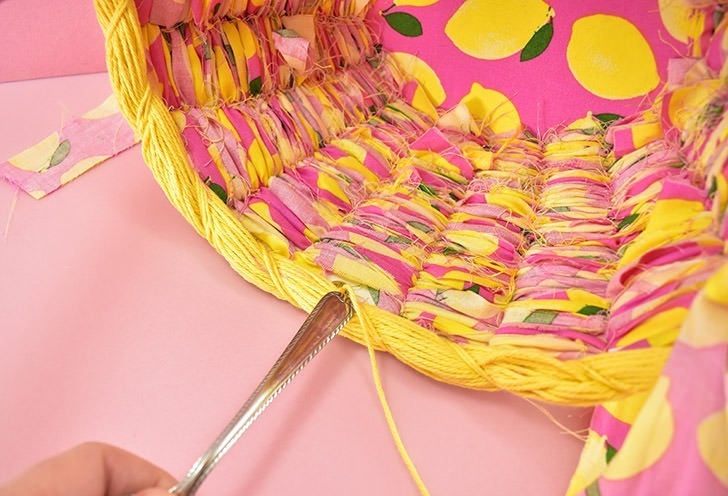 Begin wrapping the yarn around and around the top of the basket, where the frame is still visible, placing the yarn under the pins as you go. As you can see above, sometimes you’ll miss, but just be sure you don’t have a huge bulky amount over the outside of the clothespin as you work. 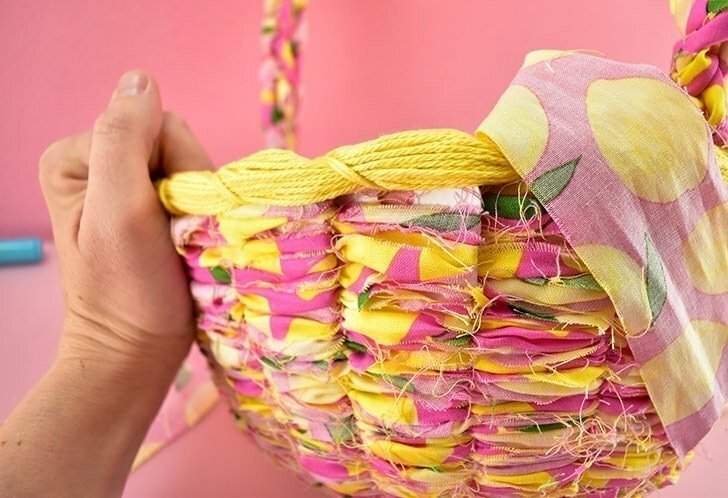 Wrap the yarn until you have a little more than you think you need to cover the matboard well and then start wrapping the yarn INSIDE of the basket, doing the same. Once totally happy with the coverage of all matboard, push the yarn around so that you cover everything, including the tops of the flaps, leaving a tail of about 2 feet. Using a yarn needle wrap the yarn’s tail around the bulk of yarn and run the needle through the hole in the next flap to the right. You’ll need to sort of push your yarn around a bit to make the needle’s way through, FYI. You might be wondering where I got my cool, red needle from. Well, I couldn’t find a proper yarn needle because it’s apparently in my new stall at the local storage facility rather than in my stuff I brought into my new workspace, I decided to DIY one up. I just took a paperclip and cut it, made a basic needle shape and then wrapped the metal around to make a loop. Since my “eye” was too big, I actually tied my yarn onto the needle because it kept slipping out. But that’s not too bad, right? I actually wound up having to better wrap in the wire poking out there on the right because it wanted to shred any yarn it came into contact with, but other than that little hiccup, it was easy sailing. Or sewing, rather. At this point, it is highly likely you still have a little bit of matboard peeking out despite best efforts. But since we made a really tight weave, it’s totally easy to cover up. Simply push the weaving upward, one fabric row at a time until you fill in the gap and cover the space. You might need to finagle a few extra rows for things to look nice and even. 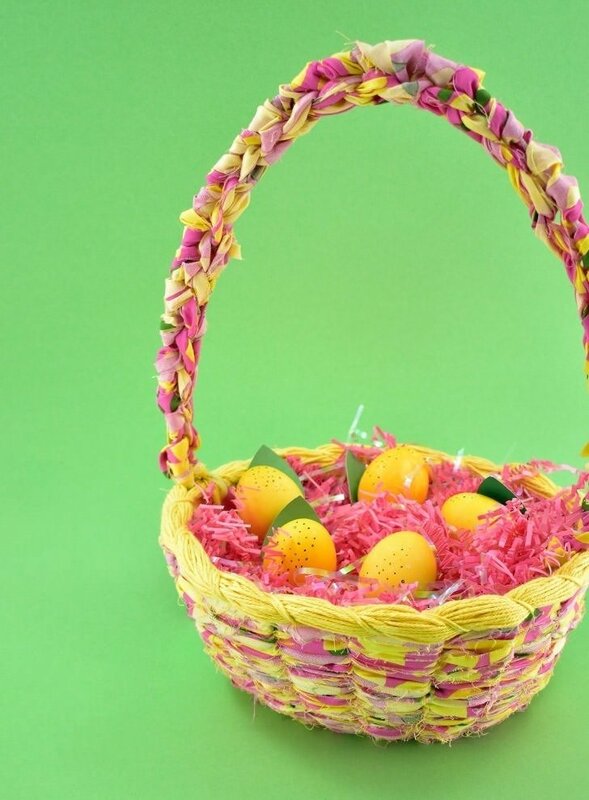 Stuff with some adorable Easter grass and this sucker is ready to go egg hunting! I blog, craft, sew, paint, glue things onto other things, cover things in glitter and basically living the dream. When I’m not crafting I’m typically cooking, watching shows about cooking, cleaning (I’m obsessed) or spending time with my fine furry fellows. I'm a crafty cat lady with big dreams and an inability to sit still. I make it, I live it, I love it. Here at Dream a Little Bigger you'll find lots of inspiration for crafts, crochet, DIY, food, pet life and all things rainbow. Lots and lots of rainbows. Visit Allison -- Dream a Little Bigger's profile on Pinterest. Sign up for my newsletter and grab my 10 most popular blog posts, I'll send them right to your email address.